Wutley Cottage is absolutely stunning! It's a charming little cottage with mellow stone walls hiding a beautiful interior. Beams, Berber carpets, Farrow and Ball colours and other traditional features blend with contemporary style to create a wonderful atmosphere. Add its quality furnishings, lovely decoration and drapes, crisp linen, fluffy towels and even a glowing log burning stove to make this a very special place!! A superb beamed lounge with glowing log burning stove, quality sofa and wing back chair, dining table and chairs, flat screen T.V., DVD , Freeview and Wi-Fi. A brilliant kitchen with bespoke units, halogen hob, combi microwave/oven, fridge, freezer, dishwasher and automatic washer. A really attractive double bedroom with Victorian bedstead, distressed wardrobe and dressing table, lovely drapes, crisp linen and fluffy towels. A small single bedroom of the same high quality. An ultra modern shower room with shower and W.C.
Linen and towels are provided. Central heating, power and an initial supply of fuel for the stove are included. A cot and high chair can be requested. There is a front garden with summer house and furniture and a small rear patio with bistro table and chairs. Parking is available on the quiet lanes around the cottage. Pets and smoking are not permitted. Access for people with disabilities may be difficult. Week bookings are normally Friday to Friday. Short breaks are available throughout the year excluding Xmas & New Year. It is the same total price for three or four nights. Central heating and power included. Parking is available on the quiet lanes around the cottage. Initial supply of logs included. Front garden with summer house and furniture. Small rear patio with bistro table and chairs. This was our second stay at Wutley Cottage and the standard was just as high as it was two years ago. The attention to detail and the effort to make guests feel welcome was just as we remember it. The cottage is decorated and appointed to a superb standard, is extremely clean, and has a warm and cosy atmosphere. Despite being small, it does not feel pokey. This is a great base from which to explore Bakewell, beautiful Bradford and Lathkill dales, Castleton and Mam Tor. We love to eat at the Farmyard Inn - the food is hearty and it has a great old country pub ambience. We also ate at the Bulls Head and enjoyed their steaks! We came away with more fond memories of one of our favourite destinations in England. 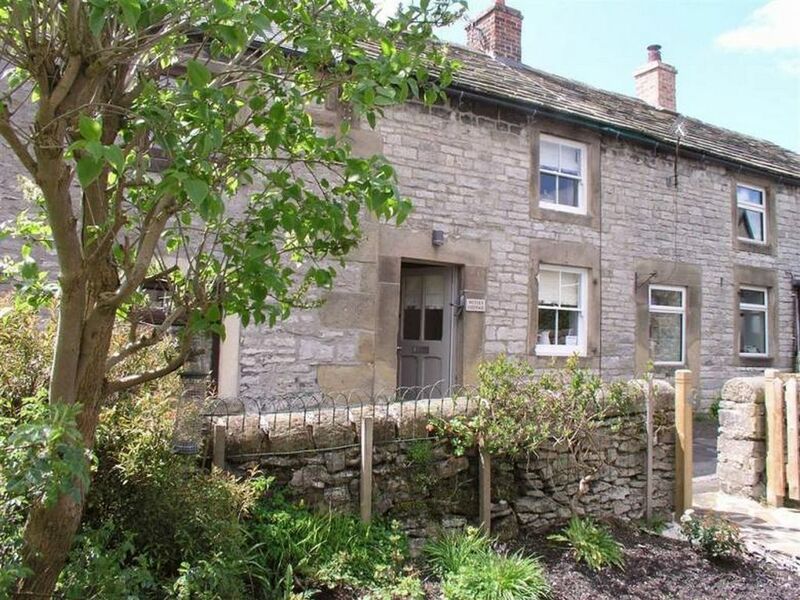 Lovely little property ideally situated for exploring the sights of Derbyshire. Wutley cottage has been beautifully renovated and very comfortable. Excellent choice for a weeks break in the Derbyshire countryside. The cottage is small and my husband did have issues with the head height!! Beautifully renovated little cottage in delightful village. Lovely cottage in convenient situation, close to local shops and pubs. Plenty of walks from cottage and short drive away. Will certainly return. My wife and I had a lovely time to explore the Peak District. The cottage is thoughtfully put together and when we arrived every thing was spotless and we were welcomed by goodies and fresh flowers. We thoroughly enjoyed our week and look forward to comeing back. On your first morning set out to explore Yougreave, one of the best villages in Derbyshire, with its lovely church, traditional shops, three pubs and quiet little alleyways tumbling down the valley side. Revel in the village but also wander along the river, spotting the Kingfishers and Dippers as you experience the peace and quiet of the Dale and incredible beauty of the surrounding Peak District hills. There are lots and lots of holiday attractions in the surrounding hills but local to Youlgreave you might enjoy Chatsworth House, Haddon Hall, Cauldwell's Mill and Craft Centre, the Peak Steam Railway and famous Bakewell - all within 10 minutes drive. But don't be too late back because it's wonderful sitting in the garden sipping a glass of wine before wandering across to the Farmyard pub for a scrumptious meal. Nearest pub - Youlgreave 100yds. Nearest village shop - Youlgreave 400 yds. Nearest supermarket - Bakewell 3.5 miles. Week bookings are normally Friday to Friday. Short breaks are available throughout the year excluding Xmas & New Year. It is the same total price for three or four nights.